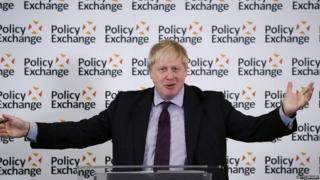 Did Boris Johnson succeed with his big Brexit speech? Right on cue - there they were to greet him. The Remainers Boris Johnson wanted to reach out to were waving 'Exit from Brexit' signs on the balcony of the building where he was to give his speech. Almost two years since the starting gun was fired on the referendum campaign, here was a message from one of the leading Leave figures to the other side: Brexit can't be stopped, but I understand your concerns and I promise there's nothing to fear. It was an attempt to bridge the divide and convince doubters of the merits of Brexit. This was a return to his key campaign themes - taking back control of laws, embracing the world beyond Europe - in a speech heavy on rhetoric. But if the foreign secretary's aim was to heal divisions, the response only served to reveal how entrenched both sides still are. Brexiteers largely welcomed it as a rousing and optimistic outline of what lies ahead for post-Brexit Britain, while those in the pro-EU camp scoffed at the reassurance. The speech was billed by Downing Street as the first in the series to be given by senior cabinet ministers which would flesh out the government's Brexit plans in the coming weeks. But this was Boris Johnson once again sketching out a rough outline of a big picture - notably light on detail. Downing Street had dubbed this the beginning of the "road map to Brexit" - but the Cabinet are not yet closer to agreeing on the desired destination. Boris Johnson once again made clear his opposition to sticking closely to the EU after Brexit as some of his colleagues wish to - warning it would be "mad" to go through all this upheaval if we weren't going to fully take advantage of the possible freedoms. Continuing to follow Brussels' rules would be "intolerable", he said. Though there was much concurring with what Theresa May has said on Brexit so far - no Boris going off message as he often has in the past - when it comes to the Brexit road ahead, we are no clearer on the government's direction of travel.